This story from The Scostman. FOR adults, the world of teenagers can seem a strange place: volcanic outbursts over the most minor problems; bands and clothes that go in and out of fashion on a weekly basis and friendships that end for the slightest reason. But any parent looking for insight into this difficult-to-comprehend segment of society could do worse than pick up the novel voted by Scottish teenagers as the best children's book of the year. However, those hoping to find their children enjoying a latter-day Famous Five or the successor to Harry Potter might be horrified to learn that its heroine is a portrait of teenage rebellion. 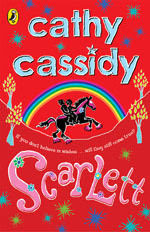 Scarlett by Cathy Cassidy tells the story of a red-headed anti-hero who is viewed by all in authority as a "problem child". She flouts her school's dress code, hates rules or authority, spouts insolence to parents and teachers alike, starts an anti-meat riot in the canteen and get herself expelled. And that's just the first five pages. Packed off to Ireland to stay with her father, who has separated from her mother, Scarlett believes it will be a repeat of her previous school record, but does not count on meeting a boy. The novel was yesterday voted as the winning book for 12 to 16-year-olds in the 2007 Royal Mail Awards for Scottish Children's Books. "The book has been marketed in a girly way, such as in the cover design, but it is a riveting story and has very believable characters. Cathy Cassidy gets inside the head of a teenager and Scarlett really sounds like one." Ms Cassidy believes teenagers may have been attracted to her book because many had experienced parents splitting up either personally or through their friends. She said: "Since her parents split up, Scarlett has felt very rejected and abandoned. Her mother does not know how to cope, and Scarlett does not feel loved." Ms Cassidy, who was born in the Midlands but now lives in Galloway, said she had drawn on her experience as an art teacher and mother of two teenagers to tune in to their thinking. She is also the agony aunt for teenage magazine Shout. In a vote of hundreds of pupils from across Scotland, Scarlett narrowly triumphed over the two other short-listed entries, The Medici Seal by Theresa Breslin, a historical novel about Leonardo da Vinci, and Nemesis: Into the Shadows by Catherine MacPhail, a mystery story. Chill, by Alex Nye, won the 8 to 11 years category - a ghostly story set in a remote house near Stirling. The 0 to 7 years category won by a picture book in Scots, Katie's Moose, by Matthew Fitt and James Robertson, and illustrated by Karen Sutherland. It involves a girl looking for her animals, which young readers can find by lifting flaps on the pages. Mr Fitt said the book would help more young Scots to become familiar with their own tongue from an early age. The winning books won £3,000 each as part of the total prize money of £15,000. The full story from The Scotsman here.